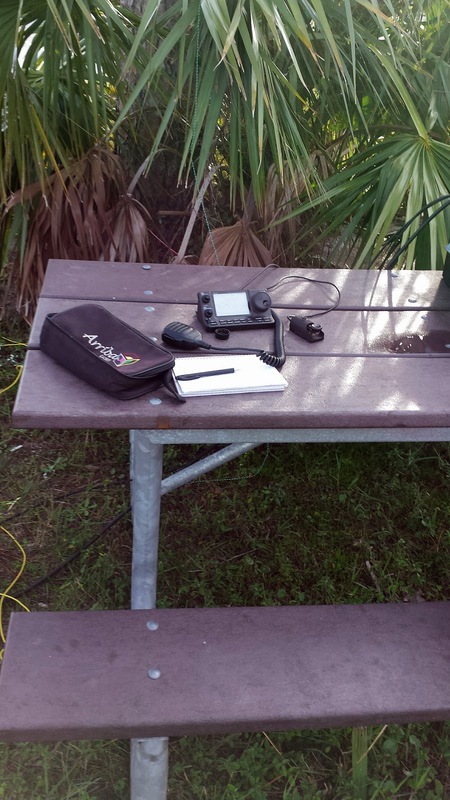 I am pretty excited about the 2016 ARRL National Parks On The Air Event. I have one designated NPS Unit within an hour's drive from Panama City. 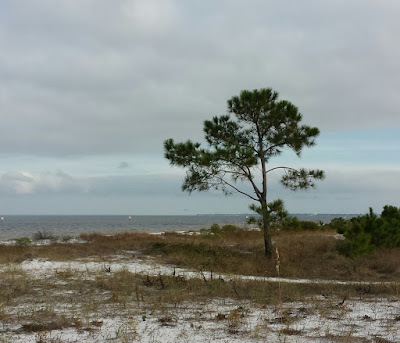 It is The Okaloosa Island Unit of the Gulf Islands National Seashore. I decided to go ahead and operate from there as a test run for an activation I hope to make at the first of January 2016. If you look at Google Maps the park is not very large. Its main feature is the shoreline on the bay. It is popular with kite surfers. I had done lots of study of the site using Google Maps. I picked out a picnic area for operating. I wanted to take Suzy of course. 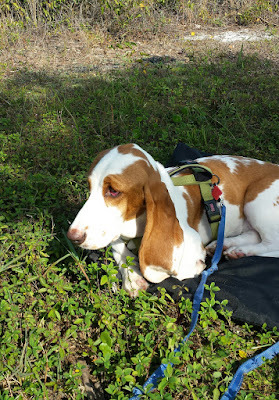 A study of the rules says she cannot be on the beach, but can at the picnic area. More on that later. Arriving at the site I had a pleasant surprise. There was a scraggly fifty foot pine with a picnic table beneath it. I could not have asked for better to deploy the Chameleon Tactical Dipole Lite. I shot a line over a high limb with my Big Shot slingshot first thing. The sixty foot legs of the dipole or doublet stretched out perfectly to neighboring palm trees. 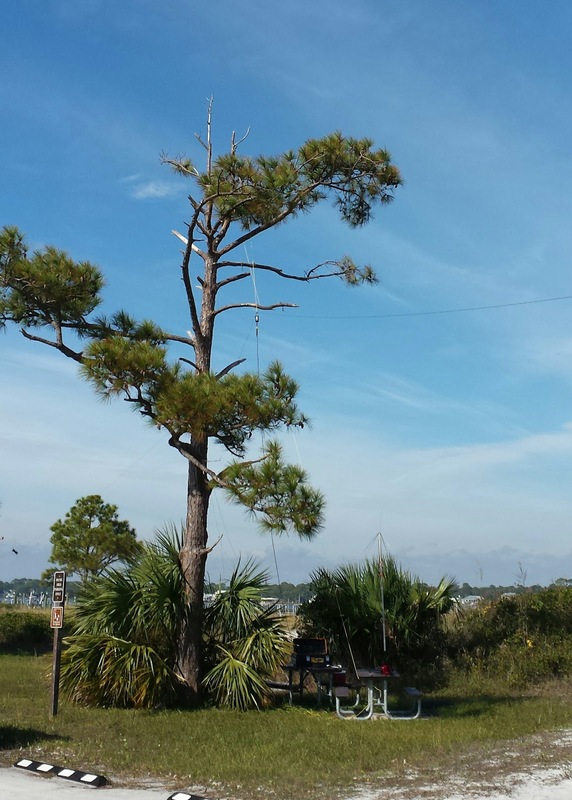 A pine in just the right place for the Chameleon Tactical Dipole Lite. The next antenna I deployed was the Chameleon vertical consisting of a Hybrid base and the MIL Whip/Extension. This amounts to a 18 foot vertical. I wanted it as close to the saltwater as possible. I ran 100 feet of RG-8 coax over a sand dune toward the shoreline. It was still fifty feet from the water. 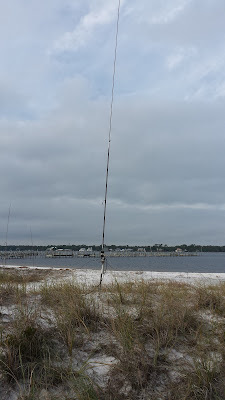 That was OK as I did not want to have a antenna interfering with anyone walking on the shore. The Chameleon Vertical about 50 feet from the saltwater bay. 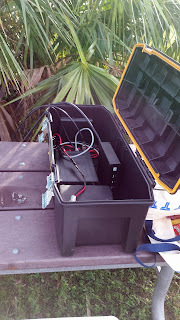 My visit coincided with the December RaDAR Roundup and I advertised my plan on http://www.radarops.co.za for the RaDAR Community. I was able to switch between the vertical and doublet. 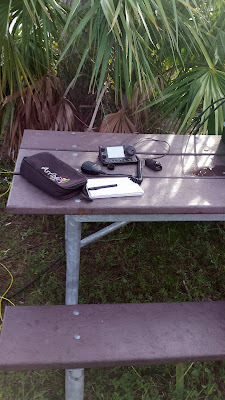 The rig was the Icom 7100 with a hefty 40 amp-hour battery. The temp was in the seventies. It was mostly overcast with a cool breeze. Bottom line I could not ask for much more from a portable location. Now for operating. I had a great run of contacts on 17 meters SSB using the vertical. The bay was between me and stations from the Northeast to the Northwest. So I will give the saltwater some credit for the performance of the vertical. The highlight of the day was a call from RaDAR operator Micky NY2MC. He was deployed on a mountain at a fire tower in New York State. He was using a a Alpha antennas 13 foot whip. We had a nice QSO. It was not a struggle at all. I switched to the tactical dipole briefly and Micky said the vertical was at least a S unit stronger. The Icom 7100 base, battery and a LDG IT-100 tuner.in the tool box. The other string of contacts was a reach back to the Panama City area. This calls for a NVIS antenna and this is where the Tactical Dipole Lite comes in handy. 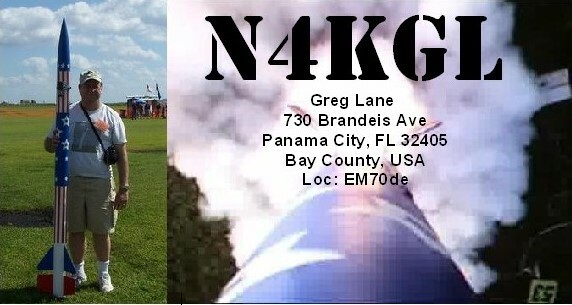 I contacted the club station W4RYZ in Panama City. Bob Leasko was the operator there and he gave me details on the Christmas party at the club that I was missed. I also contacted Vic K4GXV and Bob WB4BLX. WB4BLX was mobile in his truck. I was pleased to get a call from friend Tom WD0HBR in Dothan. He called on his 5 watt QRP station using a fifty foot wire antenna. The view toward the bay. I sampled the other bands and worked a few ten meter contest stations. I dialed back the power to five watts and worked. W2JK QRP portable in New York on 14.060. My operating wound up with a QSO with Les W8YCM/6Y5 in Jamaica. You can find Les on 18.157.5 most days now. I did learn things on the test run. A careful reading of the signs said I needed to pay the "Iron Ranger" a vehicle fee. It was $15 for a week. I complied and found out the "Iron Ranger" was a pay box. I might want to invest in an annual pass. Anyway, this requirement was missed in my advance research. I just happened to have exactly $15 dollars in my wallet. Late in the day a Sheriff's Deputy drove by and stated NO PETS IN THE PARK! I said I thought dogs could be in the picnic area but not on the beach. He said NO DOGS! So I put Suzy in the truck. It was time to pack up anyway. A park volunteer came by and asked what I was doing and she thought it was cool. She said the officer was in error on the pets policy. She said she would tell the Deputy.